Wedding and engagement photography is a tremendously intimate art form. When you, as a bride or groom looking to tie the knot in the Washington, DC, metro area, hire a wedding photographer, you are essentially inviting that person into your private life to witness (and capture on film) some very personal moments that are shared between you and the person you love so much that you want to spend your entire life with him or her. For that reason, we suggest that, as you review the work of prospective Washington, DC, wedding and engagement photographers, you look for images in which the future spouses or newlyweds appear to be inhabiting a private world of their own. In which they are so engrossed in one another that no one else even exists. The pictures that are taken of you after you get engaged or immediately after you have exchanged your wedding vows are also exceptionally personal, and the best images from a matrimonial celebration or an engagement shoot are those that draw out and display the personalities of the two people and the specific personality of their relationship. With that in mind, we believe that the best wedding and engagement photographers are those who see what makes you and your fiancé(e) special as people and as a couple, and who know how to bring that out in the pictures he or she takes. We have learned from experience that the process of taking wedding and engagement photographs is also deeply personal for the photographers. Each and every wedding photographer brings a little bit of himself or herself to every nuptials and every betrothal that they photograph. Their individual life experiences inform the artistic choices that they make regarding color, light, posing and composition. The photos that they take of brides and grooms tend to reflect they way that they see the world. Because Anji was born and raised in Hannover, Germany — a European city that is more than 775 years old — history and generation-spanning traditions have always been deeply important to her on a personal level. Even though she now works as a wedding and engagement photographer in a New World city that is barely 200 years old, she has retained that love of anything with a story that traces back multiple generations and tries to incorporate historical elements into the pictures she takes of brides and grooms whenever she can. Washington, DC, is a relatively new city (at least as world capitals go), so it can be hard to find wedding venues with very much history. That does not mean, however, that brides and grooms cannot find locales for their marriage celebrations that have a distinctly Old World look and feel. For example, the Andrew W. Mellon Auditorium, a publicly-owned space for large gatherings and events a block away from the National Mall in downtown Washington, is a stately and elegant spot that is perfect for future spouses who want a bit of European grandeur in the background of their wedding photos. The Mellon Auditorium houses an enormous Great Hall capable of fitting as many as 1000 people for a wedding reception, a beautiful old balcony that offers a stunning view of the majestically-columned ballroom below, ornate marble staircases and an outdoor patio that looks out on the Smithsonian National Museum of American History, the US Capitol and the Washington Monument. The Mellon Auditorium turned out to be a perfect spot for this particular couple to have their engagement photo shoot. Like Anji, these two future spouses had Old World sensibilities. The clothes they chose to wear for the photography session, for example, were reminiscent of fashions that were popular in the early parts of the 20th century. As a result, this bride- and groom-to-be fit perfectly with the ornateness of the interior of the auditorium and looked great when posed inside the magnificent Great Hall. 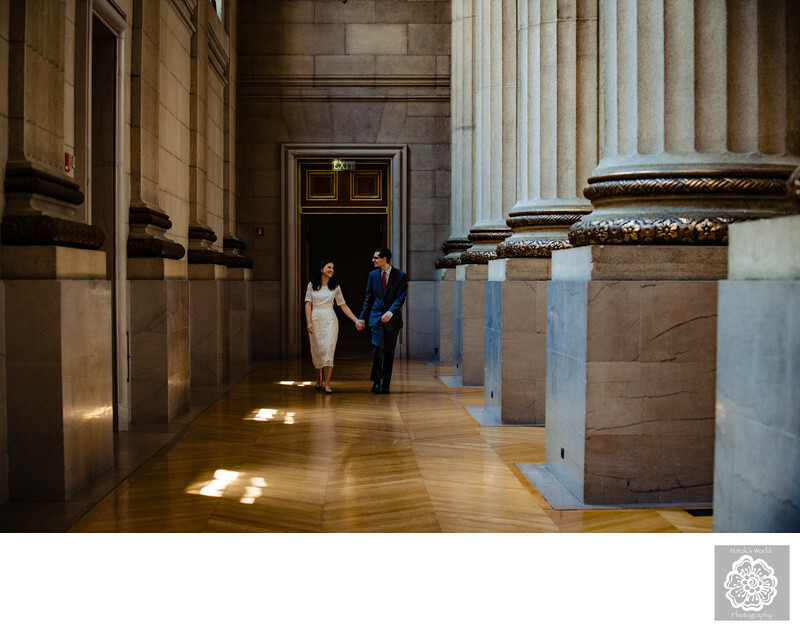 One of our favorite images from their engagement photo session was this one, in which they are strolling through a corridor of columns on one side of the ballroom, smiling at one another and seemingly lost in their own world. Because of the setting and the way that they are dressed, the picture looks like it could have been taken 100 years ago. Location: Andrew W. Mellon Auditorium, 1301 Constitution Ave NW, Washington, DC 20240.